Occupy Wall Street protesters at Three World Financial Center in New York, Dec. 12, 2011. While 2011 is over, some of the words that came to define the past year are still very much with us, and may be for years to come. Since 2011 was an especially busy year for grassroots political action, many of those new terms came from the streets. Grant Barrett, vice president of the American Dialect Society and host of the public radio program “A Way with Words,” says even in a nation as talkative as the United States, and with a language as flexible and creative as English, the word “occupy” stood apart in 2011. Barrett observes the word also has a lot of flexibility. “Occupiers” also used a variety of non-verbal communications. Holding the arms crossed in front of the chest is called a “hard block” and means “firm opposition.” Barrett also saw occupiers "twinkling." The gesture is similar to a hand motion the deaf and hard-of-hearing community uses to signify applause. While many new words and phrases occupied American speech last year, Barrett says he cannot predict which ones will become a permanent part of the American lexicon. “You just never know. It's a bit of a gamble," he says. "I would say, at least as an historical footnote, ‘occupy’ and all the related terms will continue to be talked about. It will show up in history books." 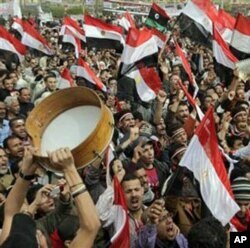 Demands for freedom and democracy across the Mideast and North Africa spawned the term "Arab Spring." As will the phrase “Arab Spring,” according to Barrett. By the end of 2011, it was a term often used by many; including protesters, journalists and humanitarian activists. Heba Morayef of Human Rights Watch was one of them. “One of the scenes that we’ve seen in many of the Arab Spring countries, first in Tunisia, then in Egypt, then in Libya and Syria are these images, usually of young men," she said in an interview late last year, "who are willing to die for ideals of freedom, for notions of rights in front of security officials with guns in city after city and this new courage to stand up to abuse we have seen, really is what has fueled the Arab Spring." “In this two word phrase we have encapsulated, we’ve made shorthand for, a lot of really important history,” Barrett says.